The favorite residential fencing material for homeowners in Manassas, VA has always been a wooden fence. It is inexpensive and lightweight and comes in many different shapes that give homeowners’ property character and personality. You can stain a wooden fence or paint the wood any color you would like to blend in with the surrounding landscape. Lumber for a wooden fence is treated to be rot-resistant making them a longer-lasting fence. The posts are usually the first to go because they are in the ground, whereas the panels last much longer because they usually don’t touch the ground. The downfall of a wooden fence in Manassas, VA is maintaining it. A wooden fence will need to be painted or stained every couple of years to preserve the wood and keep it looking new. With the many different styles of wooden fences, there are plenty from which to choose that will compliment your Manassas, VA home. Picket—These particular wooden fences are best used for front yards, gardens, and to enclose a pool area at Manassas, VA homes. They are named for their wide-spaced, pointy-topped pickets. They tend to discourage people from climbing over. Lattice—Consists of crisscrossing strips that allow air and light to pass through. 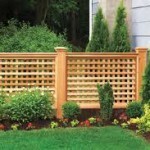 Lattice wooden fences are perfect for climbing plants and best used for decks, gardens, patios, and pool areas. Post and rail—An inexpensive wooden fence to enclose fields for livestock or to surround your property line in Manassas, VA.
Louver—Verticle louvers offer privacy but allow airflow and open views from the side. Best used for pools, patios, decks, and parking pads. Southern yellow pine—a thrifty choice for Manassas, VA homeowners but needs to be treated so it will resist rot and insects and to remove sap. Douglas fir—Strong and sap-free. Less resistance to rot than red cedar or redwood. Redwood—Stable and sap-free but clear grades are quite pricey. Cypress—A relative of redwood, it is stable and sap-free and may have small, tight knots. Eastern white cedar—This particular type of wood is grown from New England to Minnesota. It is stable, sap-free with small, tight knots. Western red cedar—A Pacific Northwest wood that is superior to rot and insect resistance. Stable and sap-free. Building a wood fence for your home in Falls Church, VA offers unlimited designs, styles, patterns, wood types and color. A wood fence can be stained or painted to match your home’s outside setting blending in with your siding and decking design and color. When shopping for fencing most Falls Church, VA homeowners are looking to fill a particular need for their family. If seclusion is what you are after, you might want a wood fence to offer you privacy for your family to enjoy outdoor activities at your Falls Church, VA home. You may have a pool that you need to enclose for safety along with following local regulations and pool codes for your area. 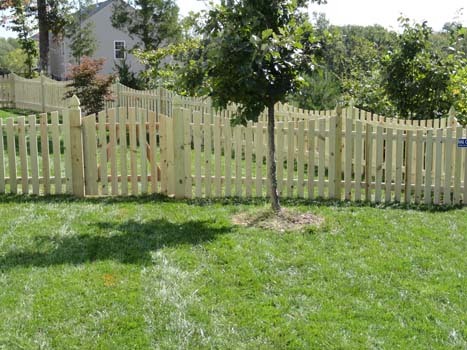 You might want protection if you have children or pets that you want to keep safe in your yard from other pets or strangers passing by your home in Falls Church, VA.
Whatever your specific needs are a wood fence offers you plenty of decorative as well as functional options. It will add extra value for your property in Falls Church, VA and is a great selling point when and if you ever decide to sell your home and move on. You can’t go wrong with a wood fence. Homeowners in Springfield, VA who live on a busy highway, in a high traffic area, or in a noisy neighborhood with lots of children and animals are constructing wood fences on their property to block out different noises. A wood fence that serves as a noise or sound barrier for your home in Springfield, VA typically uses thick tongue-and-groove boards to form a solid barrier. These wood fence boards are nailed to heavy rails supported by heavy posts. As a rule, mass dampens sounds best, so to build a wood fence that serves the purpose of blocking sounds out rather it is traffic or children, the fencing needs to be of a heavier material. For the wood fence to provide a noise barrier, you should aim for a fence that is high and solid with no gaps between the boards at your Springfield, VA home. 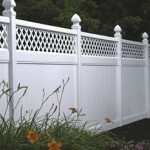 Apply mass-loaded vinyl while the fence is being constructed on your property in Springfield, VA. The posts and rails form the frame of a wooden fence. The frame is where you staple the mass-loaded vinyl. By overlapping the sheets you form a more solid barrier. Calk any seems with acoustical caulk. Attach the wooden panels to each side of your wood fence so that the mass-loaded vinyl is sandwiched in between the panels. Planting trees and shrubs can absorb enough sound to be useful pieces for your noise-barrier project. The plants can be grown either in front of the fence or in back of it or both. Evergreen shrubs or trees are best beings they provide a noise reduction year round at your Springfield, VA home. 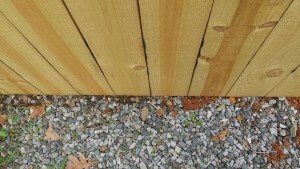 Another way to sound proof a wood fence on your property in Springfield, VA is what is called “white noise” items which is fighting noise with noise. They don’t reduce the noise but they can mask some undesirable noise such as traffic and yelling kids with a more enjoyable sound. The best way to do this is with an outside water fountain. The sound of the gurgling water is relaxing and serves the purpose of masking noises as well. A wood fence installation can bring your home a charming appeal and be the envy of your neighborhood. Many homeowners in Leesburg, VA have their wood picket fences, private wood fences, or just a simple wood pasture fence. This charm is one of the many characteristics that makes Leesburg, VA one of Northern Virginia’s finest historical towns. As you drive through Leesburg, VA, you can actually get some great ideas if you are thinking about building a wooden fence. There are probably plenty of fences you see every day on your way to and from work. 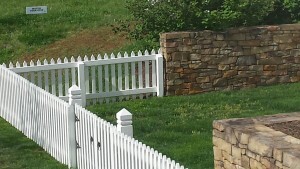 A wood fence installation can add definition to your Leesburg, VA property line. Maybe you have an enormous oak tree in your front yard, and when you visualize where you would like to have your fence line, this tree is in the way. You can define your tree by simply building your fence around it, or you can block it in and continue the fence from there. Either way, it can definitely enhance the beauty of your tree and property. 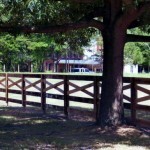 A proper wood fence installation should be done by a licensed and insured fence contractor. Building a fence is a big investment and should be done by a professional who guarantees his materials and his services for years to come. A fence contractor should also be able to give you ideas on fence types, materials and designs that you probably never considered before. Picket—adds an attractive look for front yards and gardens. Lattice—best for gardens, patios, decks, and pools. Verticle boards—overlapped or butted together, they can ensure privacy and also block the wind. Post and Rail—adds a rustic look to your landscape, encloses large fields, and separates property lines. Wood fence installations in Leesburg, VA are usually available in cedar, pine, redwood, or spruce wood depending on the style. A wood fence has a charming look, but it does require ongoing maintenance. You may need to paint or stain the fence every couple of years to keep it looking new. Check with your fence contractor; some provide maintenance as a service to their customers. 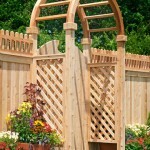 Shopping for a Wood Fence in Manassas, VA? If you are planning to make improvements to your property this year, adding a beautiful wood fence in Manassas, VA, can enhance your privacy and security, improve the curb appeal of your home, and add to the value of your real estate investment. Constructing a wood fence in Manassas, VA, involves building codes and legal requirements, proper placement and engineering, community specifications and the intricate details of wood species, fence styles, specifications, and care. The fence experts at Hal Co have delivered high-quality fencing for homeowners, landlords, and businesses in Northern Virginia since 1981, and are uniquely qualified to guide you through your wood fence project from idea to installation. A family-owned and operated company, Hal Co is fully insured and licensed. Our clients benefit from our three decades of fence experience, professional, courteous crews, and our well-established in-house design and engineering services. With state-of-the-art knowledge, techniques, and tools Hal Co is a name synonymous with high quality and dependability. We strive to capture your needs and requirements and bring them to fruition so you can achieve long-lasting results minus the headaches and missteps of a less-experienced fence contractor. We invite you to consider Hal Co for a free on-site estimate and to learn about the fence options that best meet your needs and your budget. Check our website for special offers and resources designed to help you make informed choices when selecting your wood fence options in Manassas. Save money and get the perfect fence for your needs when you choose the veteran professionals at Hal Co to install a beautiful wood fence in Manassas, VA.
Posted in Manassas, wood fence | Comments Off on Shopping for a Wood Fence in Manassas, VA? Nothing can quite replace the classic look and function of a well-crafted wood fence in Ashburn, VA.
Our Hal Co. wood fences in Ashburn, VA, are designed to protect your wood from natural expansion, contraction, warping, and splintering for durable, hassle-free wood fence performance. Ashburn, Va, homeowners can also count on Hal Co. for a wide variety of options in wood fencing, with coordinated features such as post caps, fence toppers, all types of gates, lighting and other accessories to customize your wood fence in Ashburn, VA, to best match your landscape and home architecture. Today’s wood fences improve Ashburn, VA, home values and curb appeal while providing solutions to homeowner issues ranging from privacy and security to marking legal property lines and protecting pets and children. Available in a wide range of wood species, styles and finishes, you can choose the wood fence in Ashburn, VA, that best meets your needs and budget. Wood fences for Ashburn, VA, properties are typically constructed of pine, fir, spruce, cypress, cedar, and redwood. Check wood grades and types, and look for natural or treated woods offering pest, weather and rot-resistance and color retention. From top of the line clear and premium grade woods offering consistent appearance and maximum durability to select and construction grade woods with imperfections that are less expensive, lumber yards and home improvement stores carry a wide selection of wood fence materials for any type of project. If you need the expertise of a professional fence contractor rely on the seasoned professionals at Hal Co. For a quality wood fence at your Ashburn, VA, home – expertly engineered and installed – call Hal Co., and put our 30 plus years of experience to work for you. Searching for the perfect wood fence in Falls Church, VA? When you do an internet image search for the words “wood fence Falls Church, VA,” you will instantly have hundreds of different styles of wood fences at your fingertips. It helps to have a series of pictures of your home and landscaping from different perspectives to explore your fencing needs and what distinct features you want to include in your wood fence design. And keep that cell phone handy while you run errands in case you pass an appealing wood fence in Falls Church. The right wood fence compliments Falls Church, VA, architecture and neighborhood character while providing security, privacy, access control and safety. What’s nice about a wood fence is the flexibility and variety of shapes, patterns, designs and wood species. And while some people favor more modern materials for fencing, there is still nothing that compares to the natural beauty and breathtaking variety of wood fences in Falls Church, VA.
Know your needs and get the best quality wood and installation services. Investigate building codes and city ordinances for mandatory parameters such as setback distances and fire code requirements. Learn the language of wood fencing. Knowing descriptive terms and unit measurements will go a long way in translating your needs and desires to your fence contractor, and helps establish reasonable costs. Understand standards. Along with construction techniques and insurance liability, knowing how to measure a linear board foot, estimate project timelines, and ensure legal compliance helps keep your fence contractor honest, your risk manageable, and your expectations realistic. The devil is in the details. Be thorough, ask questions, and do your homework up front so you can make well-informed decisions. Demanding new wood fence designs featuring custom woodwork, innovative mixed materials, and handsome coordinating accessories including latticework, geometric post caps, and an assortment of gates give your wood fence in Falls Church, VA, a mark of distinction. Call the professionals at Hal Co today to share in our passion for and commitment to providing high-quality wood fences in Falls Church, VA.
What Does A Wood Fence Cost in Great Falls, VA? A split-rail or post-and-rail fence, with two to four rails, typically costs $3 – $9 a linear foot for materials. Count on total wood fence cost in Great Falls, VA around $400 – $1,200 for 100′ of wood fencing and approximately $2,500 – $8,000 to enclose one square acre (about 830′), depending on whether or not a gate is included. The cost depends on whether the wood is pine, less expensive but treated to resist rot and insects, or naturally insect-resistant but more expensive cedar or redwood lumber. Add professional installation by Hal Co, a reputable fence contractor in Great Falls, VA, and split-rail wood fence cost in Great Falls, VA averages $8 – $25 or more a foot depending on labor rates, the number of rails and the ruggedness of the terrain. Sloping properties or those with challenging access will have higher costs. Lumber costs to construct a simple 3′-4′ tall decorative wooden picket fence can cost $3 – $30 and up per linear foot depending on the wood species, fence height and the complexity of your wood fence design. With a walk-or-drive through gate, or other options, total costs can be $400 – $1,800 for 100′ of fencing without installation. AskTheBuilder.com estimates total materials for a 4′ wood fence cost $325 in Great Falls, VA for a wood fence built from single wood pickets. With local, professional installation by Hal Co, backed by over three decades of quality wood fence installation, a 4′ ornamental wood picket fence costs $10 – $75 a foot depending on the style, complexity and length of your fence. Materials for a popular 4′ – 6′ semi-private or privacy wood fence in Great Falls, VA can cost $4 – $75 or more per foot depending on the type of wood, the height of the wood fence and the design. Basic fence materials for a 6′ solid wood privacy fence of treated pine or cedar without ornamentation cost $7 – $15 a foot, or $800 – $1,800 for 100′ of wood fencing. With professional fence installation a semi-private or privacy wooden fence cost in Great Falls, VA ranges $8 – $100 plus a foot. The estimated wood fence cost in Great Falls, VA for a standard 6′ tall wood privacy fence is $10 – $30 per foot, or $1,000 – $3,500 per 100′. For example, a 6′ wood privacy fence with pressure-treated fence posts set in concrete is $11.30 a foot with treated pine and $14.99 a foot in Western red cedar. That same 6′ wood fence in a semi-private design with rails and pickets spaced 2″ apart runs $18.80 a foot in pine and $25.75 a foot in Western red cedar. So much about your wood fence cost in Great Falls, VA depends on the specific variables of your land and your own wood fence requirements. Full-privacy or semi-private, cedar, treated pine or redwood, and your specific terrain will determine your wood fence cost in Great Falls, VA. The specific installation criteria will also impact your wood fence cost in Great Falls, VA. Concrete-set posts, pre-authorized Miss Utility permitting, steep slopes, challenging obstructions, or access issues can add to wood fence cost in Great Falls, VA. Talk to Hal Co, your trusted wood fence contractor, before making product purchasing decisions or signing contracts for performance. 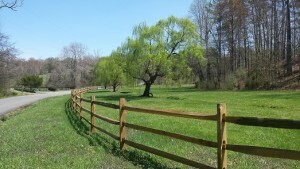 Posted in Fences, wood fence | Comments Off on What Does A Wood Fence Cost in Great Falls, VA? 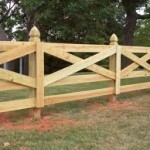 Installing a wood fence in Northern Virginia is a simple process with the right fence contractor. With almost 40 years of experience in the fence industry, the professionals at Hal Co Fence have constructed and placed thousands of wood fences in neighborhoods and communities throughout Northern Virginia. No matter what your specific needs or fence criteria are, the fence experts at Hal Co have the skills, knowledge and the talent to meet and exceed them, along with your expectations. A wood fence in Northern Virginia is a classic fence that can be made to your custom specifications along with the requirements of your land and site. With a current survey of your property in hand, we can work with you, your HOA, your neighborhood and your building inspector to design and install a gorgeous wood fence in Northern Virginia that adds security and privacy plus tremendous value to your property and your community. 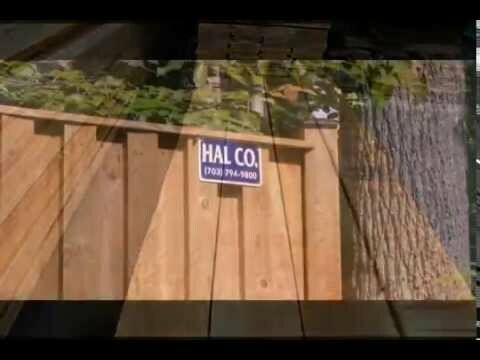 Using an established fencing contractor like Hal Co ensures you receive a well-crafted and carefully engineered wood fence in Northern Virginia that meets local building code and zoning regulations, construction industry standards and is guaranteed to honor all conditions of your wood fence product warranty. If you need a high-quality wood fence in Northern Virginia at your home for any reason, contact the certified fence professionals at Hal Co. We can help you select durable, low-care wood species, recommend smart wood fence accessories and create custom outdoor features to compliment and enhance your wood fence in Northern Virginia. Since 1981 Hal Co Fence has helped your neighbors and associates with exceptional wood fences in Northern Virginia. Call us when it’s time to install a wood fence at your house.